BRP brings Can-Am DNA to the side-by-side market by introducing the 2011 Can-Am Commander™ line-up. The five model line-up with two engine options delivers on the Can-Am promise of cutting-edge design, meaningful innovation and a focus on convenience, maximum value and more usability for the consumer. This very unique side-by-side family has been designed to bring a new level of power, handling and user-focused features to the industry. Power comes from two engine options: a powerful Rotax 800 V-Twin EFI engine, and now a Rotax 1000 V-Twin EFI engine. This gives the Commander the most power and best fuel efficiency in the industry. For example, the Commander 1000 is 39 percent more fuel efficient than its class competitor. “BRP continues to set the pace in product innovations. Capitalizing on the Can-Am brand growth momentum, we are entering in a new business segment with the Commander, which completes our product offering for on and off-road customers,” said José Boisjoli, president and chief executive officer. The Can-Am Commander line reflects BRP’s commitment to offering the side-by-side customer a machine that does not force the rider to compromise performance for functionality. Innovative features like the Dual-Level cargo box, TTI rear suspension, anti-dive front-end geometry and more, throttle-by-wire through its Intelligent Throttle Control (iTC™) system, a 2-inch diameter rollover protection system (ROPS-approved), the most fuel capacity in the industry (38 liters or 10 gallons); and the most cockpit storage of any other side-by-side. Combined with the most powerful and fuel-efficient engines in the industry, this means the Can-Am Commander is immediately the vehicle of choice for the side-by-side customer. “When we started to design the vehicle, we were determined to offer consumers a vehicle that would meet our Can-Am brand promise of delivering an exceptional riding experience. This focus on the customer also means our dealer network will have a vehicle that will raise industry standards and re-shape market dynamics as we know them today,” added Boisjoli. The entire Can-Am Commander line consists of the following models: Commander 800 EFI, Commander 800 EFI XT, Commander 1000 EFI, Commander 1000 EFI XT and Commander 1000 EFI X. With its XT and X packages, BRP, through its Can-Am brand continues the tradition of bringing unprecedented value through its factory-built packages. BRP also previewed its 2011 Can-Am Commander accessories line-up and off-road riding collections with a large assortment of the most sought-after accessories developed simultaneously with the new vehicles. The 50 accessories currently available offer total integration in form and function as well as the best riding experience. Those who are interested in a demo ride of the Can-Am Commander line of side-by-side vehicles will be able to do so on the Can-Am Ride Says It All Tour. For more information on the tour and a list of tour stop locations, please visit www.trycan-am.com. With the addition of the Can-Am Commander line of side-by-side vehicles, BRP is poised to address just about any need for the passionate off-road enthusiast and for consumers looking for more from the side-by-side experience. For details on the complete 2011 Can-Am off-road line-up and more information on each specific model, visit www.can-am.brp.com. 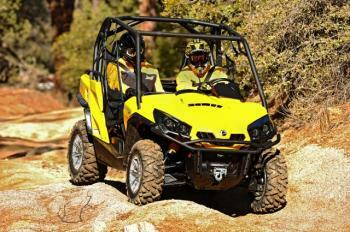 BRP enters the side-by-side market with the Can-Am® Commander™ 1000, Commander 1000 XT™ and the Commander 1000 X™. Can-Am engineers and designers worked hard to create a side-by-side vehicle that sets a new industry benchmark in performance, handling, comfort and convenience. Each model features the most powerful* engine in the side-by-side industry with the 85 HP Rotax® 1000 EFI V-Twin powerplant and brings a host of innovative features to the industry, like: Dual-Level™ cargo bed; throttle-by-wire Intelligent Throttle Control system (iTC™), a 2-inch diameter, high-strength steel cage that is ROPS approved; Torsional Trailing arm Independent (TTI) rear suspension design, removable, free-standing full-bolster driver and passenger seats; a driver seat that requires no tools to adjust; quick-attach side nets and more. 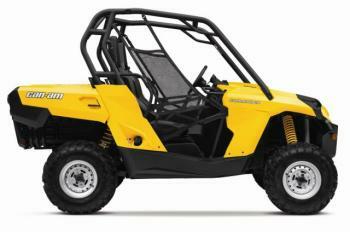 The Commander 1000 line also features sleek styling with a strong Can-Am DNA presence. Rotax® 1000 V-Twin engine // Newly developed for this project, the Rotax 1000 80º V-twin is the most powerful side-by-side engine in the industry* with 85 HP. The liquid-cooled, single overhead cam power plant features four valves per cylinder and is fed by a 54mm Bosch‡ throttle body and two VDO Seimens‡ fuel injectors. The sophisticated electronic fuel injection system automatically keeps the engine’s performance at its peak, regardless of temperature or altitude. Industry-leading fuel milage // Not only is the Rotax 1000 V-Twin EFI engine the most powerful engine in the side-by-side industry, it also has class-leading fuel mileage. Meaning you can stay on the trails longer. Dual-Level cargo box // BRP’s Can-Am Commander 1000 features the industry’s first cargo box with two levels separated by a removable, water-resistant panel. It offers the possibility to have an upper and a lower bed with an independent tailgate. Carrying capacity of the box is 600 lbs. total capacity. (400 lbs. upper, 200 lbs. lower) and has the most volume capacity in the market. The tilt-assist dump-box can be easily activated from both sides. The Commander’s box is constructed of high-strength, anti-rust and anti-dent composite. Easily removable tail gates (upper and lower), no-tools needed with single latch, truck-like, upper and lower tail gate with four tie down hooks located in corners. There are also integrated vertical grooves for plywood dividers and the Can-Am Commander also comes with an optional trunk lock as an accessory to secure the lower level. Intelligent Throttle Control (iTC) // New throttle-by-wire system that works in conjunction with the 54mm Bosch‡ throttle body to product smooth throttle delivery even if one’s foot is bouncing due to the terrain. The iTC system detects unwanted bounces and filters the input, resulting in more throttle accuracy, especially at low speed. This system also reduces the number of moving parts in the vehicle; has no cables to adjust, lubricate, or replace; and the system has an increased life span. Visco-Lok front differential // Progressively transfers power from a slipping front wheel to the gripping one – automatically with no buttons to push or levers to pull. Plus, there’s no wheel hop or driveline wind-up so the system is totally transparent to the driver and extremely easy to steer. Can lock up to 100% with no rev or speed limiter. 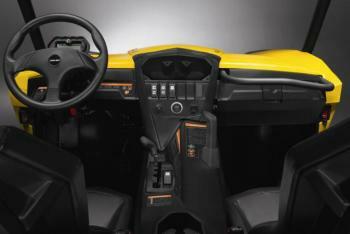 The Can-Am Commander is the only side-by-side vehicle in the industry with a progressively locking front differential requiring no additional switches to flip and engage the locking mechanism. Simply put it in four-wheel drive and ride, the differential will begin to lock only when you need it allowing you to steer easily in challenging conditions. 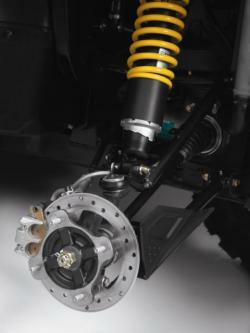 Torsional Trailing arm Independent (TTI) rear suspension // Inspired from the world of toplevel, off-road trophy trucks, this trailing arm design provides excellent control and stability, especially in rough terrain by eliminating scrub. Wheels move rearward as they move up and down producing a smoother ride than the competition, and the side-by-side does not waver down the trail. Plus, TTI has up to 75 percent fewer parts than competitive designs and significantly decreases tire wear. The rear end features 10 inches (25 cm) of travel and the largest diameter rear, five-way preload-adjustable gas shocks in the industry 36mm (1.4 inches) for overall durability and better resistance to fading. Double A-arm front suspension with dive-control geometry // Double A-arm suspension design features up front dive-control geometry, which works to eliminate diving under heavy braking and rough terrain. By controlling vehicle dive, the Can-Am Commander handling is more precise in all situations and terrain types. The front end features 10 inches of travel (25 cm) and the largest diameter front, five-way preload-adjustable gas shocks in the industry (36mm or 1.4 inches) for overall durability and better resistance to fading. 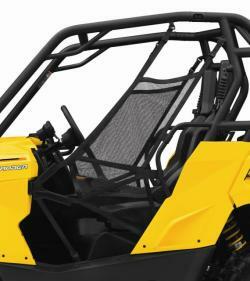 2-inch diameter, high strength steel, ROPS-approved cage // The Can-Am Commander family of side-by-side vehicles feature a two-inch-diameter, high-strength steel cage that is fully approved using the Roll-over Protective Structures (ROPS) industry standard. 1,928 cubic inches (31.6 litres) cockpit storage // The Can-Am Commander 1000 family features the most cockpit storage in the industry with almost 2,000 cubic inches of storage in three separate compartments. The glove box features 1,050 cubic inches of storage that can be divided into separate sections. In the center console, easily accessible by both the driver and passenger, features 79 cubic inches. Finally, there are 799 cubic inches of storage under the fully adjustable driver’s seat. 240-watt lighting system // The Can-Am Commander 1000 family of side-by-side vehicles features the industry’s best lighting system at 240 watts. Dual left and right automotive-style projectors run at 120 watts in low beam and 240 watts in high-beam mode. Quick-attach side nets // Side nets on both the passenger and driver side are easy to open and close with one-hand and one-click. It was specifically designed to keep a clear field of vision for driver and passenger. 10-gallon (38 litres) gas tank // Largest gas tank in the side-by-side industry for maximum range out on the trail and at the work site. Total capacity is 11 percent more than the nearest competitor. NORMAL & Performance D.E.S.S. Keys (w/ an optional third work key) // The industry’s first standard anti-theft device. Electronic code in key must match code in ECU to start. The Commander 800 family comes with two different keys. One is the normal key, which limits top speed to 44 mph (70 km/h). The second key is the performance key which has no limitation on speed or power. An optional third work key is available for purchase and limits top speed to 25 mph (40 km/h) for use on work sites. 3-point seatbelts with anti-cinch // Three-point seatbelt features anti-cinch design for added comfort. Speed limitation feature if driver’s seatbelt is not fastened properly. 11 inches of total ground clearance // 11 inches (35cm) of total ground clearance for maximum performance in challenging terrain. 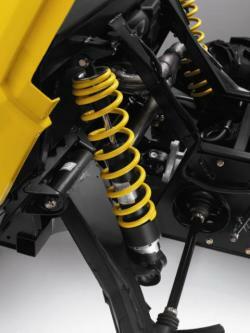 Sag is built into the suspension, allowing the system to work in its travel “sweet spot”. 214mm disc brakes with twin-piston calipers // Front and rear outboard disc brakes with 214mm discs and twin-piston calipers. 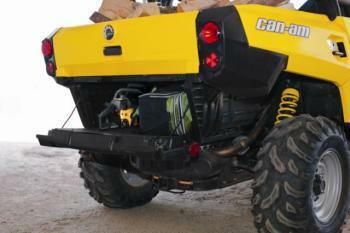 1,500 lbs (680 kg) towing capacity // The Can-Am Commander 1000 family features 1,500 lbs. of towing capacity allowing the user to tow heavy loads. 2-inch rear hitch receiver // The rear of the vehicle features a standard two-inch hitch receiver allowing for a standard vehicle towing bar and ball to be used with the Commander 1000 family. Comfort seats with sit-in fore / aft driver adjustment // Both driver and passenger sit in seats designed to give maximum comfort and refine the side-by-side experience. Full bolster seats provide lumbar and shoulder support, and provide comfort in aggressive riding situations. Both seats are designed to allow easy entry and exit of the machine. The driver seat is also adjustable fore and aft without the need of tools; it is an automotive-style adjustment for 6.3 inches (16 cm) of total adjustment. Removable, free-standing seats // Both seats are removable and free-standing allowing them to be used outside the vehicle. Set them up around the campfire at the end of a long day of riding and enjoy the evening in comfort. Adjustable tilt steering // The steering wheel is adjustable for a total range of 30.5 degrees without the need of tools. The gauge also pivots with the steering wheel for maximum visibility. Passenger handhold and grab bar // Ergonomically designed passenger handholds are located immediately in front of the passenger and to their left-hand side. The passenger grab bar in front of the seat features ergonomically correct bends for multiple and comfortable hand positions. The left-hand grip bar on the center console provides the passenger an additional handhold located in a convenient and comfortable position when required. Dual cup holders // Two cup holders in the center console feature rubber flaps for off-road use. 650-watt magneto // The Commander 1000 has the largest magneto in the industry, a full 30-percent more than its nearest competitor. This means the electrical system can dedicate up to 300 free watts to power accessories like extra lighting, GPS systems, radios, speakers and more. Easy-to-use maintenance centre // Easily accessible and out of the elements under the hood, a centralized maintenance area allows access to the airbox, radiator and coolant overflow. Fuses and relays are also easily accessible. Transmission CVT, sub-transmission with high, low, park, neutral & reverse.